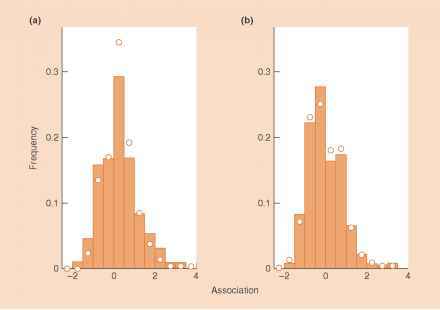 On a finer scale than ecotypes, it may also be possible to detect levels of variation within populations. Such variation is known as polymorphism. Specifically, genetic polymorphism is 'the occurrence together in the same habitat of two or more discontinuous forms of a species in such proportions that the rarest of them cannot merely be maintained by recurrent mutation or immigration' (Ford, 1940). Not all such variation represents a match between organism and environment. Indeed, some of it may represent a mismatch, if, for example, conditions in a habitat change so that one form is being replaced by another. Such polymorphisms are called transient. As all communities are always changing, much polymorphism that we observe in nature may be transient, representing transient polymorphisms the extent to which the genetic response of populations to environmental change will always be out of step with the environment and unable to anticipate changing circumstances - this is illustrated in the peppered moth example below. Many polymorphisms, however, are actively maintained in a population by natural selection, and there are a number of ways in which this may occur. 1 Heterozygotes may be of superior fitness, but because of the mechanics of Mendelian genetics they continually generate less fit homozygotes within the population. Such 'heterosis' is seen in human sickle-cell anaemia where malaria is prevalent. The malaria parasite attacks red blood cells. The sickle-cell mutation gives rise to red cells that are physiologically imperfect and misshapen. However, sickle-cell heterozygotes are fittest because they suffer only slightly from anemia and are little affected by malaria; but they continually generate homozygotes that are either dangerously anemic (two sickle-cell genes) or susceptible to malaria (no sickle-cell genes). None the less, the superior fitness of the heterozygote maintains both types of gene in the population (that is, a polymorphism). 2 There may be gradients of selective forces favoring one form (morph) at one end of the gradient, and another form at the other. This can produce polymorphic populations at intermediate positions in the gradient - this, too, is illustrated below in the peppered moth study. 3 There may be frequency-dependent selection in which each of the morphs of a species is fittest when it is rarest (Clarke & Partridge, 1988). This is believed to be the case when rare color forms of prey are fit because they go unrecognized and are therefore ignored by their predators. 4 Selective forces may operate in different directions within different patches in the population. A striking example of this is provided by a reciprocal transplant study of white clover (Trifolium repens) in a field in North Wales (UK). To determine whether the characteristics of individuals matched local features of their environment, Turkington and Harper (1979) removed plants from marked positions in the field and multiplied them into clones in the common environment of a greenhouse. They then transplanted samples from each clone into the place in the sward of vegetation from which it had originally been taken (as a control), and also to the places from where all the others had been taken (a transplant). The plants were allowed to grow for a year before they were removed, dried and weighed. The mean weight of clover plants transplanted back into their home sites was 0.89 g but at away sites it was only 0.52 g, a statistically highly significant difference. This provides strong, direct evidence that clover clones in the pasture had evolved to become specialized such that they performed best in their local environment. But all this was going on within a single population, which was therefore polymorphic. plants spread by sending out shoots along the ground surface (stolons), and the growth of plants was compared by measuring the lengths of these. In the field, cliff plants formed only short stolons, whereas those of the pasture plants were long. In the experimental garden, these differences were maintained, even though the sampling points were typically only around 30 m apart -certainly within the range of pollen dispersal between plants. Indeed, the gradually changing environment along the transect was matched by a gradually changing stolon length, presumably with a genetic basis, since it was apparent in the common garden. 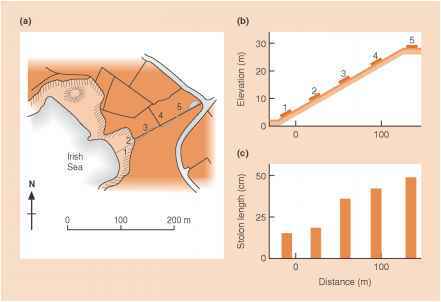 Thus, even though the spatial scale was so small, the forces of selection seem to outweigh the mixing forces of hybridization - but it is a moot point whether we should describe this as a small-scale series of local ecotypes or a polymorphic population maintained by a gradient of selection. How polymorphisms formed within species?